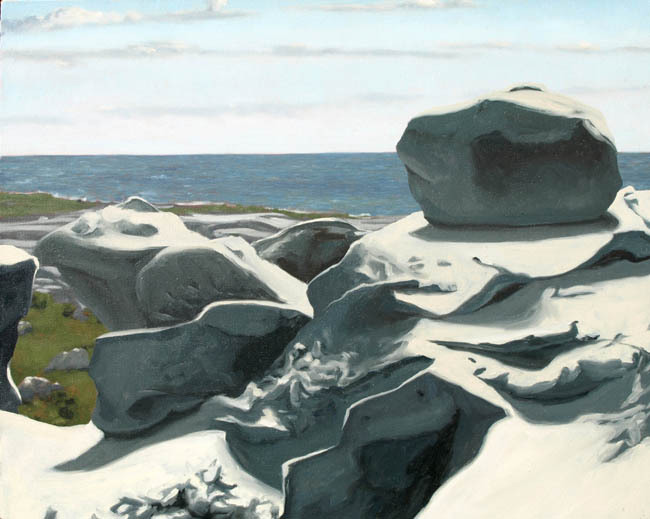 Dolmen, 20" x 40", oil on canvas, 2010. Photo courtesy of Andy Weeks. 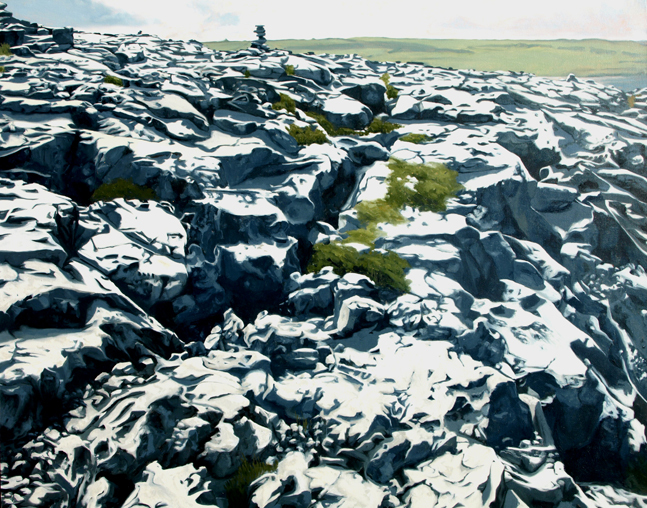 Andy Weeks, a New York-based artist, finds inspiration in Clare’s rocky landscape. Two years ago, my wife and I decided to visit Ireland. We were in the process of buying a house outside of New York and we knew that the cost of it all would keep us from traveling for a while. The trip would be our last extravagance before we focused our attention and our money on the little house we now live in. Distracted by the endless tasks involved in making the home purchase, I did not devote much time to researching our trip. I knew I wanted to try every beer I encountered, explore as many towns as I could and appreciate the examples of Medieval architecture that dotted the landscape. The reality of the experience was particularly compelling because I had not prepared myself for what I would see, eat, drink and experience. I love to drive and so I rented a car in Dublin and Elisabeth and I drove south to Kilkenny, on to Killarney and up to Galway. I knew that I would be driving on an unfamiliar side of the road, but I did not prepare myself for the fact that I would be driving on small roads that alternated between the majestic and the absolutely terrifying (very narrow and occasionally on the side of a cliff!). The drive was brilliant and, in contrast to where I was living in Brooklyn, the rolling hills of Ireland were like an endless billowing carpet of green. 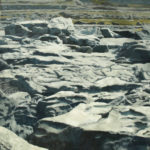 Everything I saw was stunning but nothing captivated me like the Burren. 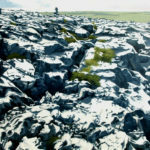 Not far from Galway, we found ourselves in Clare, driving through this endless, otherworldly rock-covered landscape. 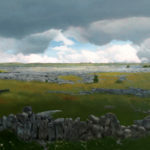 The Burren is a cold expanse of limestone pavement positioned against the Atlantic Ocean. 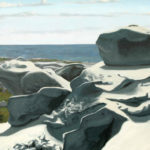 My first thought, when everything in view was rock and sky, was of Willem de Kooning. This landscape is a geological masterpiece. I love abstract painting, particularly when it is pared down to simple variables and there is attention paid to scale. De Kooning’s painting The Attic is one of my favorites because it is simple and brilliantly proportioned. The Burren was like The Attic somehow. There were limited variables. Rock. Sky. Water. Unlike The Attic, however, this place was real and I was surrounded by its beauty. 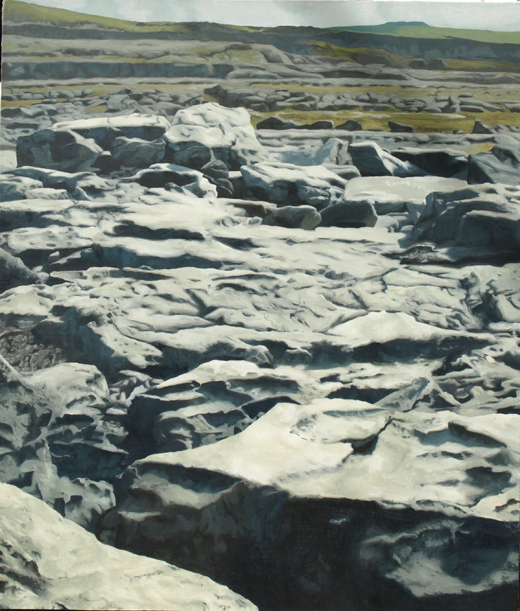 A place of great mystery, the Burren made me think of the great Romantic paintings of Caspar Friedrich and the Surrealist interior landscapes of Tanguy. It seemed to me the perfect landscape; powerful, beautiful, dangerous and peaceful. I knew immediately that I would be painting this place. 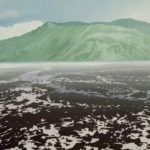 I took hundreds of photographs, did many drawings and over time constructed a series of paintings inspired by one of the great landscapes in the world. 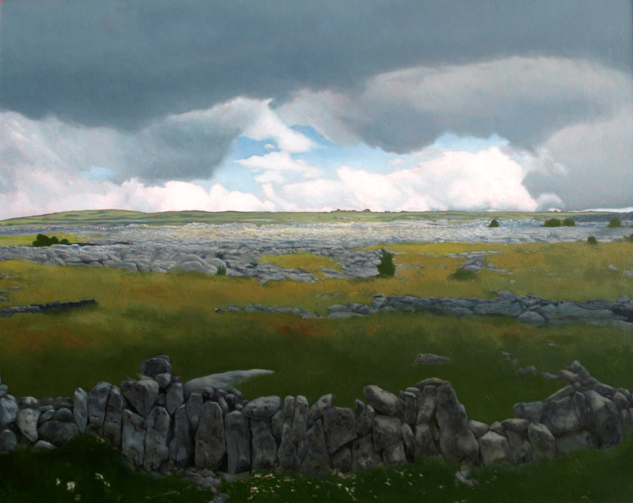 Each of my paintings is an attempt to recreate the experience of being in the Burren, that great expanse of stone broken by strangely organized fissures and small stacks of rocks. 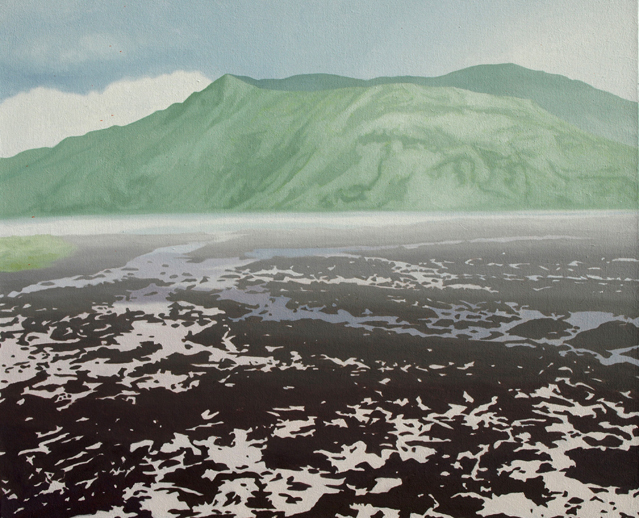 Like the place, the paintings took on an air of mystery and a strange, organized and simple aesthetic. That’s a really lovely article about the country I call home! Your paintings do it justice. Well done. Really lovely work! 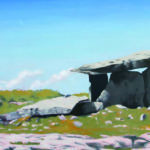 You certainly captured the mystery of the Burren – and you had good weather too!